Mark Martin Kia is a proud part of the Mark Martin Automotive Group, and we have been serving Batesville, North Central Arkansas, and Southern Missouri since 2010. We have a great atmosphere, and we have strived to create the easiest and best car buying experience in the area. We make the car buying process as smooth and seamless as possible, and we don’t have a lot of salespeople running around trying to pressure you into a purchase. In fact, there are no high-pressure sales tactics here. We value your trust. We respect your time. We will do everything possible to ensure that your experience at our dealership is pleasant and professional. Our association with Mark Martin is a special one. This racing legend, though retired, still wanted to stay close to the automotive world. For this reason, he opened a few dealerships right here in Batesville, and he also opened the Mark Martin Museum, which is right next door to us. You can visit this museum free of charge and see all manner of Mark Martin racecars and memorabilia. This, along with the accompanying Mark Martin Gift Shop, is a must see for any racing fans, and while you are in the area, you can check out all the great Kia vehicles that we have on site. Whatever Kia model you’re looking for, we can help you find it. Perhaps you desire the Optima midsize sedan with its excellent blend of interior refinement, turbocharged performance and high fuel economy. 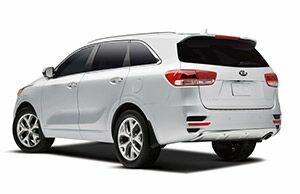 How about the Sorento SUV with its spacious interior, impressive versatility and superb safety features? We also offer the Soul wagon, with unique styling, fun-to-drive nature, and plentiful passenger space. With our wonderful selection of fantastic Kia models, there’s something for everyone, and we are continually training and working on Kia certifications so that we are able to show you how to operate and understand all of the technology on our vehicles. We also take trade-ins at Mark Martin Kia. If you have an old vehicle that that you’re trying to sell, a trade-in can make the purchase of a new Kia a more financially-feasible option. We can help you avoid the hassle and save money with our easy and streamlined trade-in process. You can calculate your trade right on our site, or just contact us and one of our friendly automotive specialists can help you work out the details. Even if a new Kia is beyond your financial means, it’s not a problem. We have an excellent stock of pre-owned cars at our dealership. No matter your price range, you can easily find a vehicle to meet your budgetary needs. Many of our used cars are Certified Pre-Owned, which means they have undergone a thorough 150-Point Quality Inspection, giving you a great deal of peace of mind for vehicle ownership. If your car needs service or repairs, you can count on our experts at Mark Martin Kia to get the job done. We never skimp on quality, and we only use genuine OEM parts. We take care of everything from regular maintenance to repairs and part replacements. Whether you have a new car or you have a car that has many miles of wear and tear, we’ll keep it running strong. Whether you’re looking for a new or pre-owned Kia, need to have your car serviced or want to buy some parts, we are ready to give you exceptional customer service at Mark Martin Kia. We can take care of all your automotive needs here at Mark Martin Kia, just give us a call or stop right into the showroom today!